Yup, Huckabee can win Texas. Texans don’t much like other folks telling them who to vote for. In 1976, when the Republican elite were pushing Gerald Ford, guess who won Texas? Nope, it wasn’t Ford. An unknown underdog named Ronald Reagan swept Texas clean…and then, four years later, he swept the nation clean. Don’t count out the power of miracles. As Mike Huckabee says, he “majored in miracles,” not math. It’s true that he cannot mathematically get enough delegates to win the nomination outright….but…and it’s a huge but…Huckabee can stop McCain in his tracks, forcing a brokered convention. Then he’ll have a chance to go toe-to-toe with McCain among the delegates. Anyone who watched the recent debates can see which of the two men is the best communicator. In the case of a brokered convention, Huckabee has just as much of a chance, if not more, than McCain in winning the nomination. The fact that Perry is so vocal about Huckabee pulling out of the race is indicative of his fear that Huckabee will WIN Texas. Oh no! That means Perry backed the losing team two times in a row, doesn’t it? 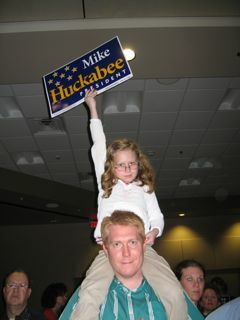 Huckabee had a rally in Texas last week, and we were fortunate enough to attend. The energy was amazing! We arrived nearly an hour early, and the room was already packed “standing room only.” We wormed our way to the front by snaking along the side wall. The folks were very nice to let us through since we had a young supporter in tow who wanted to be close enough to see Governor Huckabee when he spoke. I have never heard such a charismatic speaker nor have I ever experienced the sheer energy that I felt at that rally. Most of all, I was filled with hope for my country’s future and for my daughter’s future. To me, Senator McCain represents “old hat” politics. I am so ready for someone to come forward who will actually induce progress in solving our country’s problems! Huckabee’s stand on second amendment rights. Please check all weapons at the front desk. Yes, there are so many residents who are registered concealed handgun owners that businesses often must post those signs! The fact that my husband owned a gun was never so important to me as it was one night shortly after we were married. We lived in a second floor apartment. One night around 10pm a gang of guys knocked out our porch light and proceeded to use a screwdriver and tire iron to force open our door. My husband had the police on the phone in one hand and his handgun in the other, ready to fire if the gang succeeded in forcing open our door. Thankfully the police arrived and nabbed the kids (all were under 18 and had rap sheets a mile long) before he had to use it. Yet I had no doubt that he would fire to protect me. This second amendment right to bear arms isn’t just limited to protecting us from the bad guys. Our founding fathers set this fundamental right in ink because they had just overcome a government that had become the bad guy. What if, they wondered, what if somehow our government is overrun with someone who wants to set up another monarchy? Our right to bear arms offers us protection from such an event. Too many small business owners in Texas are overburdened with government regulations. They aren’t just competing against competitors; they are competing with the federal government with red tape and tax reporting requirements that make no sense. I worked my way through college. I lived on $11K a year. Yet that $11K was too much money to qualify for federal assistance in college. So I took out loans to help me pay for things my scholarship wouldn’t cover, like books. I had to quit my job when I became a student teacher. The minute I became a non-productive member of society, I got a Pell Grant that paid for my college. Does that make sense? Of course not! Oh yes, I did have to pay income taxes when I made $11K a year. This one is worth another $500 a month from the government. Did you catch that? She was unmarried and on welfare. If the government handed her $500 per child per month, that adds up to $1500 a month. That girl was making $18,000 a year! Go get pregnant so you can bring in some money for the family, do your part. What’s the point of keeping the terrorists at bay in the Middle East if we can’t keep decline and decadence at bay here at home? The growing number of children born out of wedlock and the rise in no-fault divorce have been a disaster for our society. They have pushed many women and children into poverty and onto the welfare, food stamp, and Medicaid rolls. These children are more likely to drop out of school and end up in low-paying, dead-end jobs, they are more likely to get involved with drugs and crime, they are more likely to have children out of wedlock or get divorced themselves someday, continuing the unhappy cycle. Moving to a consumption tax instead of an income tax will help lower income people with drive and determination have a better chance at climbing another rung on the socioeconomic ladder. It will also bring in tax dollars from EVERYONE, including those who currently bypass tax laws by doing cash-only transactions in shady circumstances, such as drug dealers, pimps, and prostitutes. We think of globalization as primarily an economic issue and the war on terror as primarily a military issue. Yet the same key unlocks the door to success in both, and that key is energy independence. None of us would write a check to Osama bin Laden, slip it in a Hallmark card and send it off to him. But that’s what we’re doing every time we pull into a gas station. We’re paying for both sides in the war on terror – our side with our tax dollars, the terrorists’ side with our gas dollars. Our dependence on foreign oil has forced us to support repressive regimes, to conduct our foreign policy with one hand tied behind our back. The other Republican candidate, John McCain, mentions nothing about achieving energy independence on his campaign website. Apparently, after all his years in the Senate, he doesn’t think it important enough to be part of his campaign. Texas has a huge number of homeschooling families who are understandably eager to elect a president who will allow them to continue to exercise their homeschooling rights. As a member of this homeschooling group, I also am very concerned about protecting my parental rights. If we are not careful, we may go the way of European nations which have ruled that homeschooling is “detrimental” to a child and have even jailed parents for homeschooling, or have taken their kids away from them and put them in state care. You can read all about Germany’s homeschooling woes here. John McCain will fight for the ability of all students to have access to all schools of demonstrated excellence, including their own homes. My caution here for homeschoolers leaning towards McCain is the “demonstrated excellence” part of the above quote. Who decides excellence? The parent? Or the government? If you allow the government to cross the line in defining its view of excellence, they may soon decide to define what ought to be taught in home schools, which leads to a whole other can of worms. I have the flexibility now for my third grader to be reading on a 6th grade level, taking a 4th grade level math course, learning about American history with a near-high-school-level attention to depth and details, doing fifth grade spelling and fourth grade science. There is no way a government-issued curriculum would meet the vast learning needs of my own child. As her parent who just so happens to be a certified Texas teacher, I know best how to judge excellence. The two Democratic contenders want to expand government oversight of education. Both candidates want to mandate pre-K for four-year-olds. Neither one of them has publicly said how they view home school, although both have expressed distaste for school choice or school vouchers. As a pro-family homeschooler, I cringe to think of what may happen to my rights to homeschool under either a Clinton or Obama-led government. Texas homeschoolers have a big message for the nation: Don’t Mess With Homeschooling Texas! I support the $3 billion the Senate has voted for border security. This money will train and deploy 23,000 more agents, add four drone planes, build 700 miles of fence and 300 miles of vehicle barriers, and put up 105 radar and camera towers. This money will turn “catch and release” into “catch and detain” of those entering illegally, and crack down on those who overstay their visas. In this age of terror, immigration is not only an economic issue, but also a national security issue. Those caught trying to enter illegally must be detained, processed, and deported. As Governor, I ordered my state troopers to work with the Department of Homeland Security to arrest illegals and enforce federal immigration law. I oppose and will never allow amnesty. I opposed the amnesty President Bush and Senator McCain tried to ram through Congress this summer, and opposed the misnamed DREAM Act, which would have put us on the slippery slope to amnesty for all. I will take our country back for those who belong here. No open borders, no amnesty, no sanctuary, no false Social Security numbers, no driver’s licenses for illegals. Senator McCain, however, has different views about illegals. His campaign website says nothing about what our nation should do about the illegals already in our country. The “DREAM” act would have effectively provided amnesty for millions of illegals by requiring them to pay a fine. Those are just some of the main reasons Texans like Huckabee. Perhaps the biggest reason Huckabee has such support is precisely due to his underdog status. Texans like to make up their own minds. We have our own way of doing life. If the rally last week was any indication of Huck’s support, I’d say he’s going to win Texas by a landslide, if only to spite Governor Perry! Let me know when Texas divides into Texas and FairTexas.